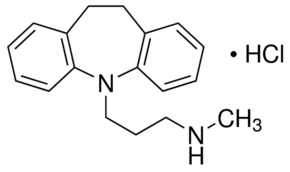 This compound is a potent inhibitor of the norepinephrine transporter, and also blocks serotonin re-uptake. This compound has also been shown to reverse the pro-apoptotic effect of chronic unpredictable mild stress in the rat cerebral cortex, although it induces apoptosis in several cancer cell lines. It has also been shown to display antiinflammatory activity in a rat colitis model. Send us your enquiry for Desipramine Hydrochloride. We offer custom pack sizes at special prices. We aim to respond to your enquiry within 24 hours. We value your input so if you have suggestions regarding new applications for Desipramine Hydrochloride email us and we will include your contribution on the website.